The HHCT has started a Historic Photograph Initiative to find and restore historic photographs of Huntington. Our goal is to select the most interesting and meaningful photographs and have them scanned digitally, then printed on archival paper, framed and displayed in prominent locations in the town. The scanning will be done by local residents so your valued photos will not be lost in shipment or the mail. 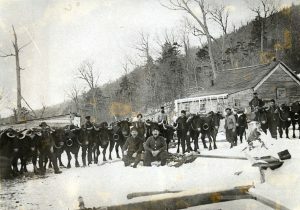 There currently are several known sources in town and others in the county and state to obtain historic photographs. However, we realize that many residents have old family photographs or photographs “inherited” with the purchase of an older Huntington homes. If you are willing to loan us your photos for review, digital copying and possible restoration, we promise to take loving care of them and return them to you unharmed. Photographs that are not taken to the restored and framed state will be saved digitally. Please provide as much information about any submitted photograph including the date, location, names of any people in the photograph and their significance in Huntington history. It is also our intent to establish a virtual museum of Huntington on line at the HHCT website. If you are interested, call or e-mail George Mincar at 434-2190 or mincar1@gmavt.net.